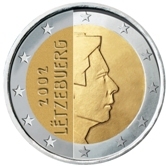 Luxembourg was one of the founding members of the Euro zone and started issuing coins in 2002. Some basic facts relating to Luxembourg. Luxembourg Euro Coins are unique in that every coin bears the effigy of the reigning Grand Duke and the Commemoratives constitute an historical record of the reigning family. 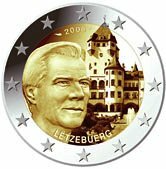 Although the Normal Currency Coins are not too exciting(having as the sole motif an effigy of Grand Duke Henri), Luxembourg has at least supplied us with a delightful set of Commemorative Two Euro Coins having issued every year since the commencement in 2004. The only country apart from Finnland to have done so. 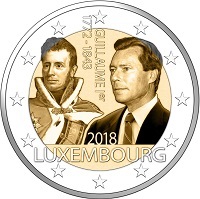 A peculiarity of Luxembourg law is that by law all coins have to display an effigy of the reigning monarch - hence not only on the standard coins but also on the Two Euro Commemoratives Grand Duke Henri is depicted. 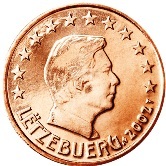 As stated above there is but one motif for all 8 coins; there are however, two slightly different portrayals of the Duke, one for the 1,2 and 5 cent coins and another for the remaining coins. 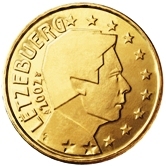 The name of Luxembourg in the local language also appears - "Letzebuerg". 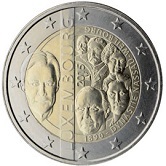 As with the Netherlands, the12 stars representing Europe in the 1 Euro and 2 Euro coins are arranged in the form of a semi circle. This is against the latest guidelines which require the 12 stars to be as in the European flag - i.e. in the form of a complete circle. 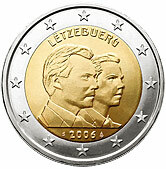 Presumably at some time in the future the design of these two coins will be altered to reflect the new guidelines. 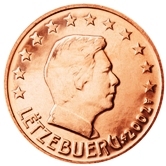 1 cent - Grand Duke Henri of Luxembourg. 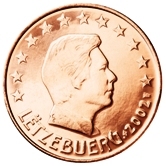 2 cent - Grand Duke Henri of Luxembourg. 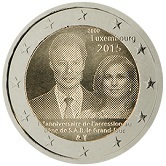 5 cent - Grand Duke Henri of Luxembourg. 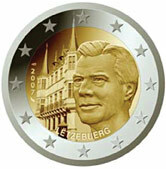 10 cent - Grand Duke Henri of Luxembourg. 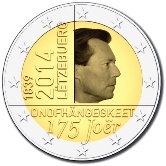 20 cent - Grand Duke Henri of Luxembourg. 50 cent - Grand Duke Henri of Luxembourg. 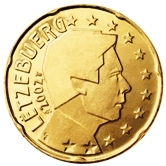 1 Euro - Grand Duke Henri of Luxembourg. 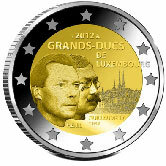 2 Euro - Grand Duke Henri of Luxembourg. 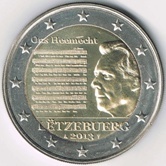 Luxembourg Commemorative Two Euro Coins. 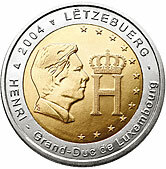 2004 - Effigy and Monogram(an "H" toped with a crown) of the Grand Duke Henri. 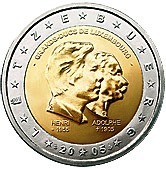 2005 - 50th birthday of Grand Duke Henri, 5th anniversary of his accession to the throne and 100th anniversary of the death of Grand Duke Adolphe. 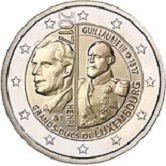 2006 - 25th birthday of Grand Duke Guillame.Shown on the coin is the image of Grand Duke Henri superimposed on the image of Grand Duke Guillame. 2007 - Grand Ducal Palace - this is shown on the left while the Grand Duke is shown on the right. A slightly unusual feature is the year shown vertically at the extreme left of the inner ring. 2008 - Berg Castle -shown on the right with the Grand Duke on the left. 2009 - 90th anniversary of the Grand Duchess Charlotte's accession to the throne. 2010 - The arms of the grand Duke - these are shown on the right, the grand Duke is on the left. 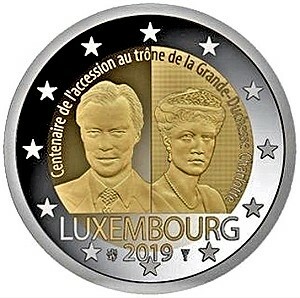 2011 - 50th anniversary of the appointment of Jean Grand Duke of Luxembourg by his mother,the Grand Duchess of Luxembourg. 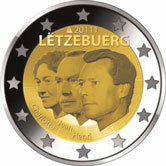 Shown on the coin from left to right Charlotte,Jean and Henri. 2012 - 100th anniversary of the death of William IV, Grand Duke of Luxembourg. 2012 - The wedding of the Heir Grand-Duke Guillaume with the Countess Stéphanie de Lannoy. 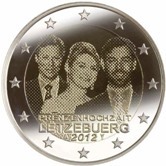 2013 - National Anthem of the Grand Duchy of Luxembourg. 2014 - 175 years of independence. 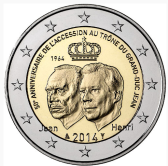 2014 - 50th Anniversary of the Accession to the Throne of Grand Duke Jean. 2016 - 50th Anniversary of the building of the Grand Duchess Charlotte Bridge. 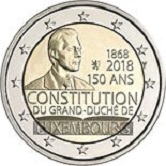 2018 - 150 years of the Luxemburg constitution. 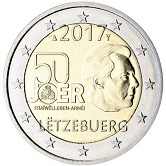 Although this is a 2018 commemorative, it was actually issued late in 2017. 2018 - 175th Anniversary of the death of Grand Duke William I. in 2017. 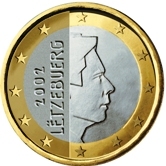 2019 -This coin commemorates the 100th anniversary of the abdication of Maria-Adelheid. 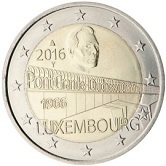 Return from Luxembourg Euro Coins to Links to Specific Countries. Return from Luxembourg Euro Coins to euro coin collector.